Allows the displayed image to be flipped horizontally or vertically. 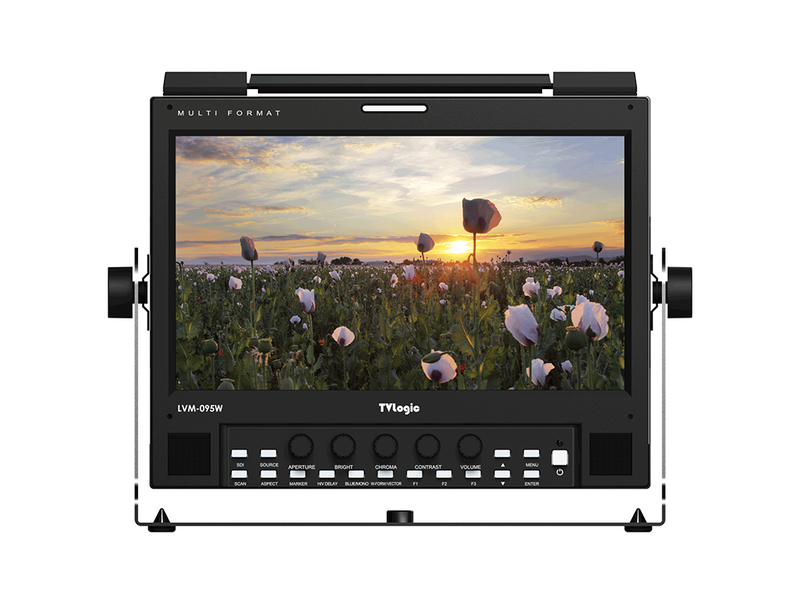 This feature provides flexible mounting options for camera operators. Applies the LUTs to the outbound Log signal. A LUT for every major camera manufacturer has been included(LOG-C, C-LOG, S-LOG 1,2,3 and RED Gamma 3,4). LVM-095W-N는 기존의 9인치 모니터를 Full HD 해상도 패널로 업그레이드시킨 포터블 모니터로 스튜디오나 촬영 현장에서의 모니터링에 이상적인 제품입니다. LVM-095W-N는 가볍고 튼튼한 알루미늄 소재로 만들어졌으며 전면 컨트롤 패널에 기능키와 5개의 컨트롤 노브가 배치되어 있고 랙 마운트 키트에 장착하여 사용이 가능하므로 우수한 공간효율성을 자랑합니다. 또한 더블 탈리, Waveform 및 Vectorscope, UMD, 1:1 Pixel Mapping, Range Error, Marker, Focus Assist 등 전문가를 위한 다양한 부가 기능을 제공하며 V-Mount가 기본 장착되어 있어 별도의 배터리 브라켓 없이도 배터리 장착이 가능해 활용성과 경제성이 극대화된 제품입니다. , 3G-SDI Level A/B, Audio Level Meter Display, Blue Only, Focus Assist, H/V Delay, H/V Flip, Key Lock, Luma(Y') Zone Check, Marker, Mono, Range Error, Temperature Adaptive Color, Time Code Display, UMD, User Aspect, Various Scan Modes, Waveform/Vector, Zoom, Camera Lut.